Ryan Burke, the first former member of Beta Theta Pi at Penn State to plead guilty in the hazing death of Timothy Piazza, has been ordered to serve three months of house arrest. At Tuesday's hearing, Judge Brian Marshall also ordered Burke, 21, to serve more than two years of probation, perform community service and pay more than $3,000 in fines. In June, Burke pleaded guilty to four counts of hazing and five counts of alcohol-related crimes. Prosecutors said that after fraternity pledges had successfully made it through an obstacle course called "the gauntlet" in which they were forced to drink, Burke "walked around with a bottle of vodka and made underage fraternity pledges, including Piazza, drink from it." Piazza was given 18 drinks in 82 minutes, prosecutors said. Defense attorneys in the case have said that while Piazza's death was a tragedy, the 19-year-old made his own choices regarding alcohol and the fraternity's event. "An element of this case certainly is our freedom of choice and our free will," Burke's attorney, Philip Masorti, said, according to the Daily Collegian, the student-run newspaper. "It's very regrettable, but it is nonetheless true that Mr. Piazza chose to pledge, he chose to drink, he chose to attend the gauntlet." Piazza died two days after he suffered a fractured skull and lacerated spleen. His death was initially treated as an accident; Penn State President Eric Barron said later that Piazza had endured "inhumane treatment" at the fraternity's hands. "The state attorney general's office asked for 30 days' jail time," Min Xian of member station WPSU reports from State College, Pa. "Burke's attorney said the punishment was fair and, in court, Burke gave a brief statement, saying he was 'truly sorry.' "
The Pennsylvania Attorney General's Office took over prosecution of the case after the local prosecutor cited a conflict of interest. In a grand jury indictment, Burke was identified as one of four fraternity brothers who were seen in a surveillance video carrying an apparently unconscious Piazza up a flight of stairs after his fall. A large bruise was clearly visible on Piazza's abdomen, the jury said. They placed Piazza on a couch and tried to rouse him. Burke lifted Piazza's limp arm, and when he let go, it fell back to the young man's chest. The next morning, when it was obvious that Piazza was in trouble, fraternity members waited more than 40 minutes before calling an ambulance, according to court papers filed by the grand jury. 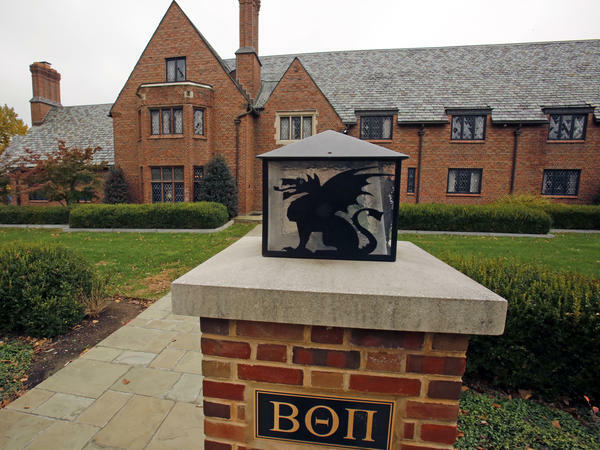 In the wake of the hazing incident, Penn State permanently banned Beta Theta Pi. Some of its former members were accused of tampering with evidence, in an attempt to sanitize both their fraternity house and their phones. The most serious charges in the case were thrown out last September, when Magisterial District Judge Allen Sinclair voided charges such as involuntary manslaughter and aggravated assault. He also dismissed the cases against four defendants and ruled that other charges should be for misdemeanor crimes, including reckless endangerment. Criminal counts for a second group of defendants — who were charged after more video evidence was recovered — were reduced or thrown out in May by another judge. The grand jury in the case criticized leaders at Penn State last December, when it said the Greek system seemed to be focused "mainly on excessive drinking and social debauchery." Penn State administrators had been "remarkably undisturbed" by complaints about dangerous alcohol abuse at fraternities, the jury said in its report, adding that "it was only a matter of time before a death would occur during a hazing event." "This didn't have to happen," Piazza's father, Jim, said after the first indictments were announced last year. "This is the result of a feeling of entitlement, flagrant disobedience of the law and disregard for moral values, that was then exacerbated by egregious acts of self-preservation. Again, this did not have to happen. No parent should have to deal with this."